Running behind your little one to get him dressed to school or get him to bed is so stressful. Each and every parent would wish to have a magic wand at the stroke of which would make their kids disciplined and know the value of time. • Children like to be treated as adults, so gift wrap a digital alarm clock and timer and gift it to him. • Make a note of everything you tell your kid. Make sure you are not strict while doing so. Once your kid decides the amount of time needed, then decide on the wake up time. For example, if your child needs 1 hour to get ready and he has to be at the bus stop by 8.30am then his wake up time would be 7am ( including 30min grace time in case of unexpected situations). 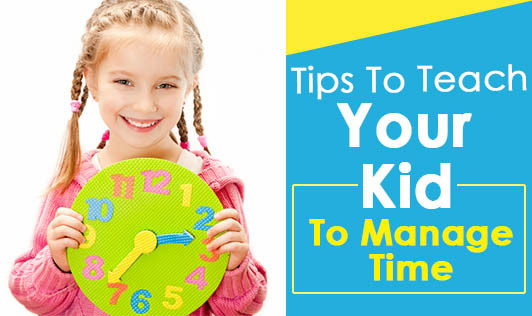 • Then, show him how to set an alarm on his digital clock. The key is to make them understand that they need to get up at the right time. Place the alarm clock at a place where they can see it but have to get out of the bed to turn off the alarm. • You can also put a small time slip on the bathroom door with the activity and the time allotted like brushing - 10min, taking bath-15min etc. Once the activity is completed your kid can put a tick against the activity which would give him joy and confidence. • Next thing would be to teach him how to set the timer for particular activities like breakfast -15min or polishing his shoes-5min etc. • The time spent on watching TV can be reduced. Ask your kid which programmes he would want to watch and keep it next to the TV. Have him cut back on watching TV gradually. • Have your kid make a home work chart that would have the list of assignment through the week and let him check mark it when he has completed it. Make sure you make the whole process of teaching a fun process as kids tend to learn quicker. This process will require guidance until he is familiar with it. But, the most important thing for a parent would be to have patience so that your kid would become more responsible and organised throughout life.